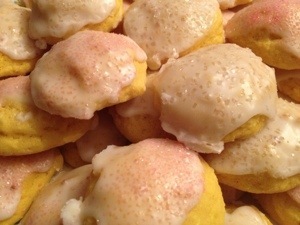 Simply make your favorite drop sugar cookie (I made a ricotta lemon cookie) with yellow food coloring, frost with sugar glaze and sprinkle with pastel sugar. The secret to any cookie is consistent shape and size. I use my smallest cookie scoop for this task. 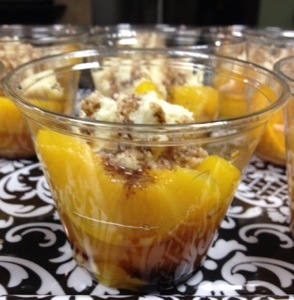 The glaze is two cups of confectioners sugar, the zest and the juice of one lemon plus water to get to 4 tablespoons. To glaze the cookies, line a few cookie sheets with parchment (easy clean-up) and invert the cookie quickly in the glaze and roll around to coat. Set glazed cookies onto the lined sheet. Much of it runs off onto the parchment (you’ll be glad you lined the sheet) so don’t over do it. Only do 5-6 cookies at a time or the glaze will dry and you won’t be able to sprinkle. Sprinkle with colored sugar and let dry. They package easily and you can stack them. Cream butter and confectioners sugar on 4 using a stand mixer. Add vanilla until blended. With mixer on low (stir setting) add 1 cup of flour until blended. Add 2 cups nuts until mixed through. Refrigerate for at least two hours or overnight. Using a small (1.25″) cookie scoop, roll into balls placing onto an ungreased cookie sheet, ½ inch apart. I like using parchment paper for easy clean up. Bake 25-30 minutes until cookies are a creamy color. Place foil under cooling racks. 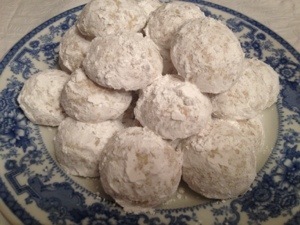 Cool cookies for about 10 minutes on the rack then roll in confectioners sugar and place on cooling rack. Cool completely. Roll cookies one more time and place in storage. You’ll thank me for the foil tip! Makes 7- 8 dozen little cookies. In large bowl, with a wooden spoon, mix all ingredients except the spices. Add spices and stir until blended. Refrigerate at least an hour or overnight. Using a small cookie scoop, place small teaspoons onto ungreased cookie sheets. Bake about 9 minutes. Cool on racks. Roll in powdered sugar or frost with your favorite chocolate frosting. Makes about 5 dozen small cookies. It always feels like I have more time than I do on December 1st. Decide what I am baking. 1. 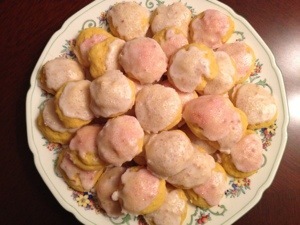 Cut Out Cookies – I use the “Deluxe Sugar Cookie” recipe from the book shown above. It is Betty Crocker‘s Christmas Cookbook Copyright 1982 by General Mills. It is a great recipe, delicate and buttery… Recipe to follow later. 2. Magic Cookie Bars – I always say I’m going to make these during the year but usually save the treat for Christmas. 3. Oatmeal Crackles – these are one of my son’s favorites. 4. Shortbread – I use a recipe from my friend Lauren. Years ago I attended a cookie exchange. It was fun and I loved the sisterhood of sharing. Cream together butter and sugar. Add flour one cup at a time. Press into 13″ x 9″ glass baking dish. Score with fork. Bake for 45 minutes at 350 degrees. Sprinkle with granulated sugar. Couldn’t be easier. 5. Chocolate Spice Cookies – I got this one from my mother. It is made with a cake mix. Boom! Of all the things that I do at Christmas, my favorite is baking cookies. I love the joy it brings my family and friends and use them as a personal gift to my colleagues. I have tried many things over 32 years and have developed these secrets. That it saves me time is the icing on the cookie! Plan with the end in mind. Why are you baking? Is it to have cookies to share at home with your family and friends? Do you need to package them and travel? Do you want to do this as a family project? Do you want to bake and share (this is what I do)? Whatever your reasons, determine them now because it will determine the kinds of cookies you should make. Picture your cookie tray. When you decide what kind of cookies you want to bake think about color and shape. While I love chocolate, try to bake cookies that have a variety of color. Less really is more! Decide what to bake. 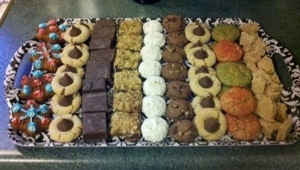 There were years when I would bake 15-20 different kinds of cookies. Was I nuts? Perhaps, but I was also not employed outside the home at that time. 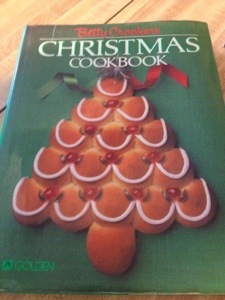 I have a Christmas cookbook from the year I was married. I continue to use recipes from there along with those I have clipped or downloaded throughout the years. Since I went back to work fulltime, I ask my family to identify their top three cookies from my repertoire. I do not include cut-out cookies in their list because that is a family favorite and is the only cookie I do not share. This year I am making 8 kinds. Plan twice, shop once. I get laughed at all of the time when I go to the store with my list but not having to go back to the store to buy a key ingredient allows me to have the last laugh. I make a spreadsheet which has all of the ingredients on each row. The columns are for each cookie and the totals determine how many pounds of flour, bags of chocolate chips or containers of colored sugar I need. When I say I list everything, I mean everything including the storage container. I take an inventory of containers prior to shopping and fill in as needed. I love the new plastic containers which won’t break my heart if not returned. When else do you even think about Cream of Tartar except at Christmas? Mix all cookie dough and refrigerate before baking. If you are making any bar cookies, mix and bake those while you are mixing all other cookie dough. I cover each bowl with Press and Seal Wrap so that I can write the kind of cookie on each bowl. I do not use my mixer again until I make frosting. This saves a tremendous amount of time. Even if you do not have the entire day to bake, bake one type of cookie before you go to work. Choose a size and stick with it. Early in my cookie baking career I decided to make all my cookies the same size. This makes packing easier and presentation prettier. I used a melon ball gadget until it snapped on the rock solid chilled dough. Plan B! I bought a small sized heavy duty cookie scoop at a gourmet store. It is a great investment and I highly recommend making that purchase. Making your cookies small gives you more bang for your buck, especially if you give many away. Invest in 4 heavy cooking sheets. I purchased half sheet pans from a restaurant supply store. They were “marked” meaning they had a few scratches. I figured that I would scratch them as soon as I used them so saving about 50% seemed like a good plan. Use parchment paper. Before my cookie baking marathon, I measure a whole roll of paper, cutting and folding it so it fits the sheets. I put them between several pans to keep them flat. I change the sheets as needed but you can bake more than one batch on them. This assures your cookies will not stick to the pan as well as allows you to reuse pans without washing them during the baking process. Buy about 6 inexpensive cooling racks. I cover my table with foil then line the racks on top. I cool sheets on top of my stove for a few minutes before moving the cookies to the table racks. I bake two sheets at a time. Have one rack on the low setting and one just above. Set one timer for the entire baking time and the other for half way. At the half way mark, switch racks and bake for the remaining time. Bake cookies that need to be frosted last. This way, as you bake you can store the cookies and get them out of your kitchen. Living up north gives us an advantage because we call our garage our outdoor fridge! Over the next few weeks I will post my favorite recipes. Easily the best apple pie I have ever made. 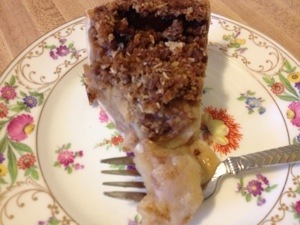 It is from Food.com and came together into the yummiest apple pie ever! I didn’t even put on the caramel ice cream and pecans and that pie is just a memory. Remind me to tell you about my epic pie crust fail!